Inclusion, Civility and Disagreement: Where Do You Stand? Special Orientation events introduced first-year students to Dickinson's stance on inclusion, civic engagement and ethical reasoning. Photo by Carl Socolow '77. Respectful disagreement is a cornerstone of learning, and a vital skill in an increasingly globalized world. 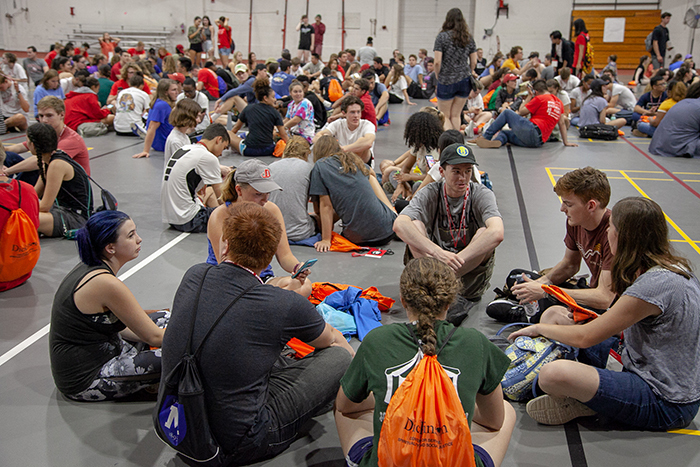 Within days of arriving on campus, members of Dickinson’s class of 2022 had already begun to practice this critical skill during an Orientation week event, Where Do You Stand? “Often we end up talking with people we already agree with, and we don’t have good conversations when we disagree with each other,” said Amy McKiernan, assistant professor of philosophy. “This activity is designed for you to be able to say what you think and why, and then for you to be able to engage with people you disagree with, but otherwise respect." This interactive event was just one of the Orientation activities designed to introduce students to three key features of Dickinson culture—ethics, inclusivity and civic engagement.